Our 2 Column Cast Iron Radiators are available in four different heights. 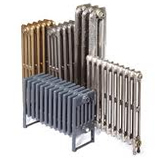 This traditional solid fin range of early twentieth century 2 column cast iron radiators are cast in Europe and assembled at our factory in North Yorkshire. With a practical appearance and a high BTU output, this cast iron radiator is a distinctively early twentieth century design. As standard they come finished in a primer, with the option to have them painted in any standard RAL colour or fully polished these can be finished to suit any property, be it a period or contemporary building. Delivery time is usually within 14 working days, please contact us if you have any urgent or special requirements.